Jacob Z. Goldstein (b. 1947) was born in Brooklyn to a devout Chabad family. In 1967, the Lubavitcher Rebbe instituted the Tefillin Campaign to get all Jews – especially those distant from Jewish religious practice – to regularly don tefillin. Goldstein diligently took up the cause. 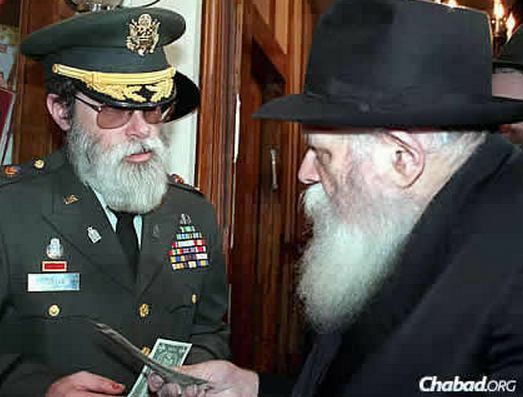 He was soon visiting a military base to provide tefillin for Jewish soldiers. By 1977, the base’s Catholic chaplain requested that Goldstein enlist in the army as a chaplain himself. With blessings from the Lubavitcher Rebbe, Goldstein agreed. He has since served all over the world, in places like Afghanistan and Iraq, Bosnia and South Korea, Grenada, Israel, and even Cuba’s notorious Guantanamo Bay. 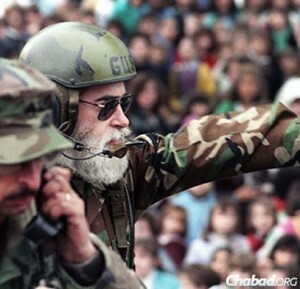 Following the 9/11 attacks, Rabbi Goldstein was the Chief Chaplain at Ground Zero. Similarly, he was in charge of the chaplaincy in New Orleans following Hurricane Katrina. Over the years, he has helped to permit wearing beards for religious reasons in the armed forces, bring kosher meals to American soldiers, pave the way for more Jewish chaplains, and establish holiday observances and prayer services at military bases around the globe. He has risen to the rank of Colonel, and despite the typical mandatory retirement age of 60, has remained in the armed forces for an additional eight years due to a lack of chaplains in the force. Rabbi Goldstein finally retired last month after 38 years of dedicated service. In addition to his military role, he is also the longest-serving chairman of his Community Board in New York, and has been noted as a successful local politician, and a promoter of interracial cooperation and understanding. This entry was posted in Law, Politics & Military, Religious Leaders and tagged 9/11, Afghanistan, American Jews, Bosnia, Brooklyn, Chabad, Chaplain, Colonel, Community Board, Cuba, Grenada, Ground Zero, Guantanamo Bay, Hurricane Katrina, Iraq, Israel, Kosher, Lubavitcher Rebbe, New Orleans, Orthodox Jews, Rabbi, South Korea, Tefillin, US Army on May 20, 2015 by Jew of the Week.